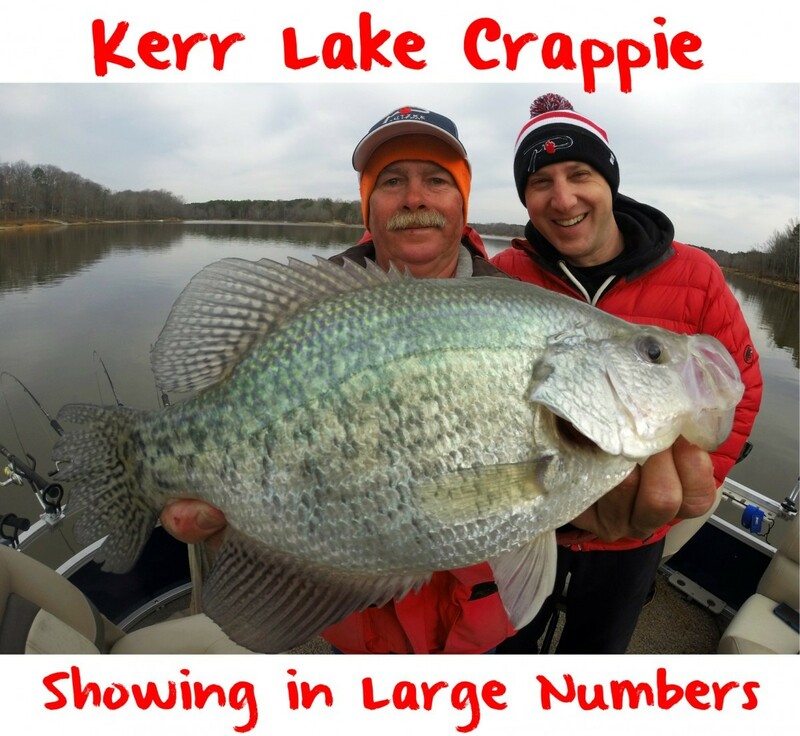 Largely in part to not having cold weather to extended periods of time it’s been a better than average year for crappie fishing on Kerr Lake. 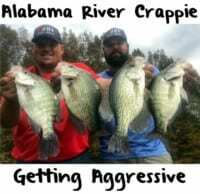 This year, there haven’t been many days where you couldn’t catch a big mess of crappie. While I don’t think the bite will last as long as it does most years due to the stable weather it’s usually good through April and May. Today we caught 150 and had 54 keepers. Yesterday we caught 150 and had 51 keepers and the day before we caught 150 and had 94 keepers. We are seeing some larger fish, too. We are getting them up to 1.75 pounds. Last week we caught one bigger than 2.5 pounds. It’s been a good year and there’s plenty of larger fish still around. What has made things unusual this year is the water isn’t as high as it normally is. 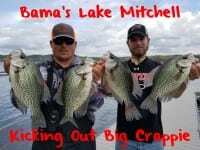 Many of the places the crappie spawn most years is dry. Many of the creeks people are used to fishing are dry. The crappie are spawning on brush piles instead. The fish are on brush piles in the creek mouths now. To be honest, I’m thinking the brush pile bite is going to get better. There’s one wave of crappie that’s already spawned. The next wave that spawns is going to move back out and we are going to have more to catch. We’ve been targeting them three ways: spider rigging in the shallows, with jigs on brush piles and with a cork and slip bobber on bush piles. All work. Meanwhile, which method we use depends on the weather and wind, and also how many people are on the boat. I’m catching them on brush piles casting and winding chartreuse jigs. Chartreuse has been the hot color. I haven’t strayed away from it because its been working. You can also set up on top of brush piles with live Chartreuse Fire Dye minnows and catch them. If you were going that route I’d put them on a slip cork and adjust your depth. You want the live chartreuse minnow on top of the brush, but within inches of the brush pile. You don’t want it in the brush pile because you’ll get hung. If you are in a place where the water is really clear you can have it a foot above the brush and they’ll come up and hit it, but if the water is stained you’ll have to get it right on the brush. If you have a day with no wind and you’re able to take a trolling motor and stay directly on a pile you can catch these fish. The other technique I use when there’s more than four people on the boat is trolling a Road Runner. When we troll them we tip them with the live Chartreuse Fire Dye minnows. There’s people that don’t tip minnow when they troll, but the best trollers up here won’t put a Road Runner out there without a minnow on it. Again, that chartreuse minnows has been big for us this year and caught our largest fish. If you are spider rigging in the shallows, and by that I mean six foot of water or less, I’d use a live Chartreuse Fire Dye minnow. That’s been the hot ticket for us this year. Spider rigger will continue through the next full moon and possibly three days after. After this happens spider rigging is over until next year. Editor’s Note: Chris Bullock operates Kerr Lake Crappie & Cats. For more information on his guided Kerr Lake crappie trips please visit www.kerrlakecrappieandcats.com or call 252-902-4039. Pautzke’s new Chartreuse Fire Dye is now available at most North Carolina & Virginia Walmart locations and Bass Pro Shops.